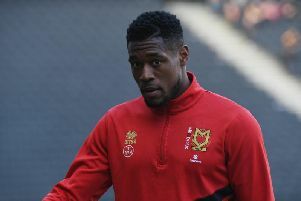 Elijah Adebayo scored with effectively the last kick of the game as Swindon Town salvaged a point against MK Dons on Saturday. Joe Walsh fired home after just five minutes, converting Dean Lewington's corner, but in a cracker at the County Ground, Adebayo's shot 90 minutes later would earn a point for the home side. Both sides had chances to score, with Jordan Houghton clattering the bar for Dons, while Swindon were denied a clear penalty when referee Trevor Kettle deemed a foul outside the box. Following Tuesday's 3-0 defeat to Premier League Bournemouth in the Carabao Cup, Paul Tisdale reverted back to the side which beat Exeter City 1-0 last Saturday. Joe Walsh, Callum Brittain, Kieran Agard and Robbie Simpson all returned to the side, with Osman Sow and Sam Nombe named amongst the substitutes. Returning to the side after being rested on Tuesday appeared to do Joe Walsh the power of good as it took him just four minutes to get on the end of Dean Lewington's fifth minute corner, hammering past Lawrence Vigouroux to give the visitors the lead. The goal though masked Dons' average start to the game. Dons looked hurried on the ball, rushed by an eager Swindon side and were often wasteful in possession. When they did eventually settle into the game, they should have doubled their advantage when Kieran Agard broke the offside trap on the left flank, and waited for Alex Gilbey's run, though his cross was cut out by Sid Nelson before it could reach the midfielder. There were still shaky moments though, especially in defence. Callum Brittain was sluggish out the gates and played his side into trouble, allowing Keshi Anderson to get a shot away, only to see a combination of George Williams and Walsh take the sting out of it before it reached Lee Nicholls. But it was a new Dons side which emerged in the second half, and they were a matter of inches away from doubling their lead just two minutes after the restart when Jordan Houghton's long-range rocket clattered the bar, before Jordan Moore-Taylor then forced Lawrence Vigouroux into a full-stretch save. Robbie Simpson had the simplest chance of the lot though 11 minutes into the second period, but he was just short of Agard's cross after good work from Gilbey to bring Dons forward. But Swindon were cruelly denied a spot kick when Callum Brittain hauled down Steven Alzate in the penalty area, only for referee Trevor Kettle to deem it outside the box. Matt Taylor sent the free kick just over the bar. It was end-to-end stuff throughout the second period, but deep into stoppage time, Taylor's hopeful ball into the area wasn't dealt with by the Dons defence, and substitute Adebayo was on hand to lash home an equaliser from close range.